LANDOVER HILLS, Md. (WUSA9) -- Prince George's County Police are searching for a man who exposed himself to a woman and touched her inappropriately at a store in Landover Hills, police said. The incident happened at a big box store located in the 6200 block of Annapolis Road, authorities said. 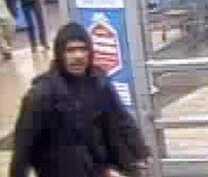 The suspect revealed himself to the woman shopper and then touched her. The woman was able to push away the man and find help. If you have any information, please call 301-699-2601. LANDOVER, Md. (WUSA9) -- Eastbound Route 50 in Landover was shut down for almost twelve hours on Sunday after a tanker truck crash, fire officials said. The tanker ran off the road and into a ditch near Route 202 around 5:50 a.m. fire officials said. The driver was taken to a trauma center, officials said. Hazmat officials spent hours cleaning up 22 hundred gallons of fuel that spilled onto the road during the incident. The road reopened just after 5 p.m.
LANDOVER, Md. (WUSA9) -- A year after a mailman was murdered in Maryland police and the United States Postal Service inspectors returned to the community to pass out flyers in hopes of getting information on a possible suspect. Tyson Jerome Barnette, age 26 was shot and killed on the job on the night of November 23rd, 2013. The shooting happened in 1600 block of Reed Street, police said. Police responded to the scene around 7:20 p.m. and found Barnette suffering from gunshot wounds. Barnette was pronounced dead at the scene, police said. The crime is still unsolved, and a year later, some neighbors say they remember it well. "I've been living here in Cheverly 32-years and this is the first time that someone has been killed in our neighborhood, and it was very frightening," Robin McClain, an area resident, told WUSA 9. LANDOVER, Md. (WUSA9) -- Prince George's County police are seeking the public's assistance in locating a missing woman from Landover. Police say Alishia Trava Bush was last seen in the 2100 block of Matthew Henson Avenue on Oct. 7 at about 2 a.m.
Bush is described by police as an African-American female, 5'5", 155 pounds, with black hair and brown eyes. She was last seen wearing a white shirt and black pants. Anyone with information on her whereabouts is asked to call the Prince George's County Police Department's Regional Investigation Division- Central Region at (301) 772-4911. LANDOVER, Md. (WUSA9) -- A pedestrian was killed in a hit and run collision on Saturday evening. The hit and run occurred in the 6700 block of Annapolis Road in Landover hills, police said. This incident is under investigation, we will provide more details as they become available. LANDOVER, Md. (WUSA9) -- An 11-year-old girl was hit by an ambulance Friday evening, Prince George's County fire officials said. It happened around 5:15 p.m. at the intersection of Greenleaf Road and Romney Court in Landover. Paramedic Ambulance 806 from St. Josephs Fire/EMS Station in Springdale was responding to an incident when the girl was hit. The girl was taken to the hospital for pain in her lower extremities, officials said. Her injuries are non-life-threatening. Witnesses said the girl may have walked out into the street from behind a Metro bus, officials said. "It is a matter of standard operating procedure for the driver of the paramedic ambulance to undergo post-accident testing. Both members of the crew will also go through an internal safety review of the incident," according to a news release.